This is a place to discuss movies that are not related to Summer Glau or Terminator. There are many good (or bad - if you want to warn other people) movies but creating dedicated threads for every of them may be an overkill. So if you saw a movie you want to tell others about feel free to do it in this thread. Cameron: My brother says if you want to be good at anything, you have to practice every day. I've just saw a movie "Soul Surfer". This movie is based on a true story of Bethany Hamilton - a girl from Hawaii who wanted to become a professional surfer... Well, I do not have a TV and I mostly read scientific news, so maybe I'm the only one who have never heard her story until last weekend. Anyways if you know this name you have probably already seen this movie, but if you don't then I do not want to make spoilers here (you may google her name or the movie title if you want to). I can only say that I have not been that excited since I saw "The Blind Side" about a year ago (by the way it is also based on a true story). I think this is a movie of the year and I highly recommend to watch it. You should not miss this movie. Not much free time lately; still don't have seen Smallville last season's episodes. I don't think i will contribute too much to this thread but i'm still happy to read what other members like and would like to share with others. Yes, I understand that. You probably noticed that I did not post much in recent weeks. I hope I'll be back to normal soon. I have not seen any Smallville episodes at all. Actually I have not seen many movies most of you probably saw: "Avatar", "The Dark Knight", "The Social Network", just to name a few. (Well, I actually want to see "Avatar" but I have no idea where I can see it in 3D now). I guess sometimes I spend more time choosing the movie than actually watching it I'm glad I saw the "Soul Surfer": it's a very touching and very inspirational story. I have seen all (almost) the classics from the American, French and Italian movie and have built a solid culture in this domain; now i only watch the american blockbusters (mostly science-fiction) because i want to be entertained when watching a movie. I am currently rewatching 'Lonesome Dove' in widescreen 720p for the first time. It is my favorite western of all time. Tommy Lee Jones, Robert Duvall, Steve Buscemi, Danny Glover, Chris Cooper, and the eternally lovely Diane Lane, amongst others. It's the story of a pair of ex-Texas Rangers who uproot and drive their herd from Texas to Montana. Written by Larry McMurtry(the author of Brokeback Mountain). Probably one of the greatest writers of the western genre of all time. I watched "Tangled" recently. Awesome animated movie. It is loosely based on the German fairy tale "Rapunzel" by the Brothers Grimm. Interesting detail: with the production budget of $260 million it's the second most expensive film ever made. While I would not classify this film as a "must see" I'm pretty sure if you see it you will like it. As most of Disney's movies this one is great to watch with the entire family. But it may not be appropriate for very young audience: the movie got rating "PG" and you may read why. I was not going to buy a Blu Ray/DVD but as far as Amazon provided a $5 discount to those who rented the film I decided to move on and now this is the latest addition to my collection.
" It's just an object. It doesn't mean what you think... "
" Pain ... It is the healing, purifying scalpel of our souls " - Warhammer 40000 universe. I saw "Kung Fu Panda 2". I think the first one was better, but this one is also good and worth watching. In this movie we learn about Po's past (and he learned that too ) and the ending looks like we'll have a third movie. Also I like the bonding between Po and Tigress. I got an impression that her story is also something to be told. Yes, it's hard to watch because of a lot of violence but it's a great movie. I'll just mention some names associated with it: Dwayne Johnson, Billy Bob Thornton, Tom Berenger, Maggie Grace, Moon Bloodgood (anyone remembers T4? ). Music composed by Clint Mansell (creator of "Lux Æterna" a.k.a. "Requiem for a Dream"). I'm not sure I can recommend watching it but if you are ok about graphic scenes you may go on. For those who like classical science-fiction or who prefer a good story instead of CGI wonders and bold action I would highly recommend the Dune miniseries(preferably the Director's cut) from 2000 and its sequel Children of Dune from 2003. Fantastic story with surprising plot twists, huge amounts of character development and an unbelievably captivating atmosphere backed up by a powerful musical score. BTW I would like to see Summer as adult Alia Atreides some day! New high-res "Transformers 3" pics have been released; one retained my attention, because it reminds me another one from "The Cape". The difference between these pictures : Summer Can act. Red carpet are green in Russia? Btw, we got it, she has long legs, but can she act. 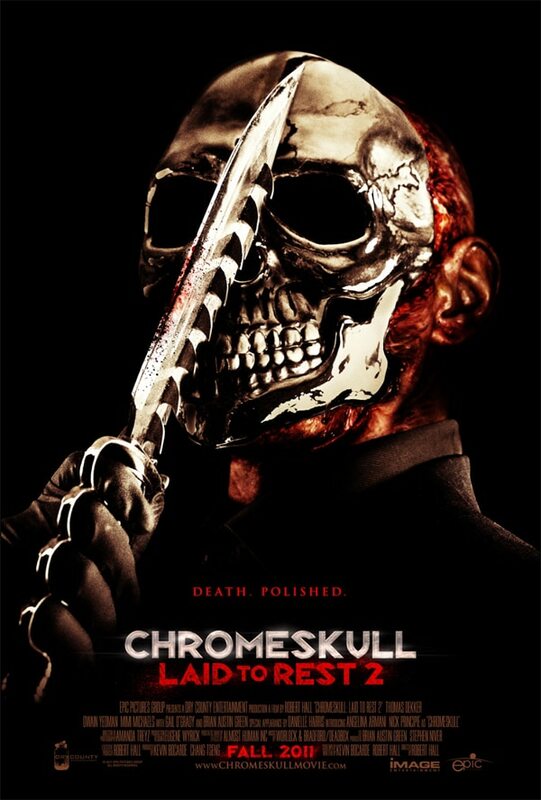 For horror movies amateurs, the trailer of "Laid to Rest" sequel is out : it's called "ChromeSkull: Laid to Rest 2". The producers decide to make a sequel after the good DVD sales. They've cast 3 former TSCC actors in it : Brian Austin Green, Thomas Dekker (was in the first film) and Owain Yeoman. This slasher was filmed in November 2010 and the release date is October 31th, 2011. Thomas Dekker is ok but BAG's acting is not that great imo.